Latest....put this date down in your diary! the next UKDK Com Reunion 3 event. 'Rising from the Dead'- after nearly 25 years UK Decay back on stage in Luton!! What a night! What a buzz! ï¿½A night of reminiscence, that was for me. the surprise performance of UK Decay themselves. tribes and many from the neo generations of punk urbane-ology. yet poignant portent for what was to come. and then the band departed! with their Mohawks, Kilts and studded leather wear! culture, perfectly summing up the original punk ethos. by Matt Rogue, another Luton Punk legend in the making. they provided a ï¿½moshingï¿½ finale to the ï¿½live-bandsï¿½ part of the evening. always come to an end whilst the iron is at it's hottest? play longer as well, but that was the tome of the night! the presentation of the old footage. simply played back during the intermissions on the main projector. At the end of the night, the Hat Factory was in a state of devastation! someone had nicked some coffee mugs and a spout from the cafï¿½ above. But nothing will take away the sheer vibe and buzz of that evening! fantastic montage artwork from the evenings proceedings. 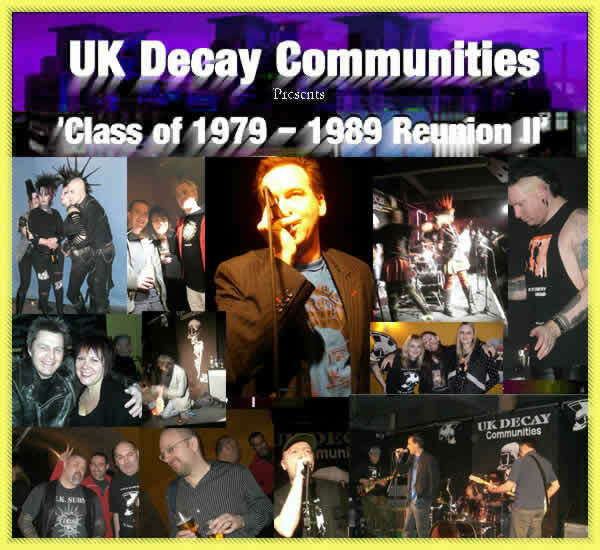 Roll on ï¿½Class of 1979 ï¿½ 1989 Reunion IIIï¿½! Werewolf for Uk Decay Communities! We shall have to see! 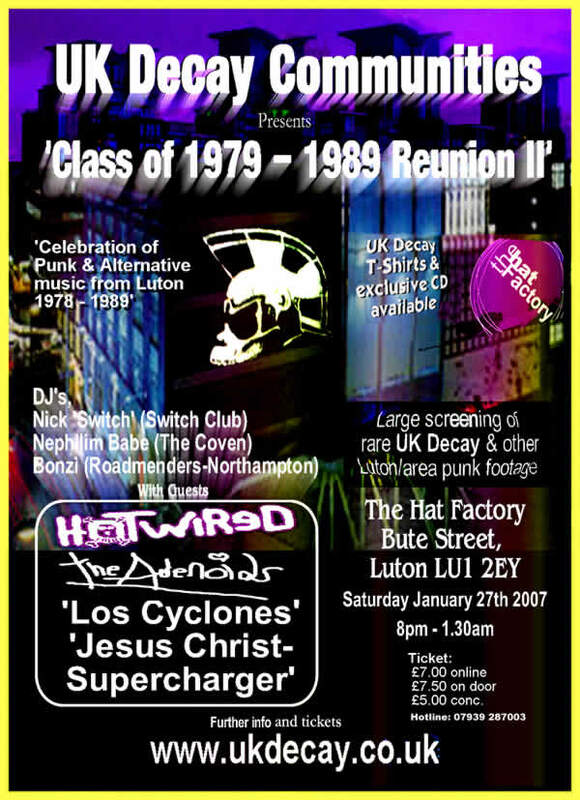 'Celebration of Punk & Alternative music from Luton 1978 - 1989ï¿½. soul with a dark twist". .
Philpot, on drums, 'Johnnyï¿½G' on guitar and 'Dan-the-Man' on bass. All three, played in the well-known 80's Luton band, 'The Party Girls', in the mid-eighties. proceedings before the DJ's take the floor. music from the late 70's till today! providing a taste of darker beats from today's premier Luton alternative club 'The Coven'. DJ Bonzi from Northampton's Roadmenders will also be adding to the occasion. post-punk, goth, or any of the sub-genre's, whether from yesteryear or today, is invited. Online Ticket sales will cease 2am GMT Thursday 25th January! the night, hopefully including T-Shirts and CD's! Any other Luton/area Punk footage? to show this on the night! the Luton Library Theatre gig C1984! but there is stuff out there! and authored onto DVD before the night! so; lets see what is out there! Sadly UK Decay will not be actually playing at this event! he is a busy man these day's, it remains to be seen if he will turn up! UK/DK COM RE-2 HOTLINE phone number. Artist & band that are appearing, some links. The capacity of this venue is sticktly limited to 200! That online ticket sales will cease at 2am GMT on Thursday 25th January! Missed the last one cos of my crappy job. Gonna book time off for this now! Posted: Thu Oct 05, 2006 10:44 pm Post subject: Los Cyclones ! Good job we havn' done the flyers and posters yet! 5 or 6 of us coming all the way from Stopsley! Look forward to seeing you Blink after 20years. Better save me two spots, my son wants to come. God I feel old.